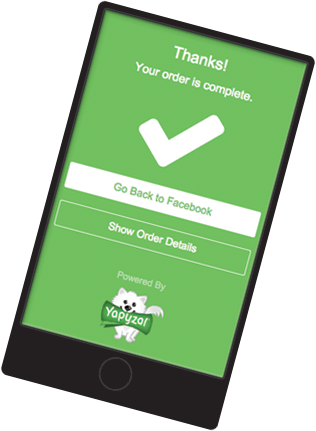 Yapyzal empowers merchants & non-profits to sell their products or accept donations on Facebook for FREE! Like It. Buy It.® Without Leaving Facebook. Yapyzal is the first and only standalone Social Commerce engine that makes it easy for merchants to sell their products on Facebook for FREE! Our patent pending service and unique approach to Social Commerce allows anyone on Facebook to make an impulse purchase without ever leaving your business’s Page. Your products are promoted on your Facebook Timeline and in news feeds, a feature that allows you to reach 78% of Facebook’s mobile users. Yapyzal supports a growing number of payment gateways including Authorize.net, Bridgepay, First Data Payeezy, PayPal Pro and Stripe. Do you have the next big viral hit? Get started selling to over a billion people on Facebook with Yapyzal! Support for popular payment gateways. Provides your business with incremental revenue through Facebook sales. Create a custom post and upload an image that appears on your timeline and in news feeds. Customize the schedule for when your posts will appear. Upload up to 4 additional photos for your product or cause. Secure and seamless checkout. The entire transaction takes place without customers leaving Facebook! Customize shipping options and offer store pickup. Donors can choose from preset donation amounts or let them enter their own.